“And He sent them out to announce and preach the kingdom of God and to bring healing. 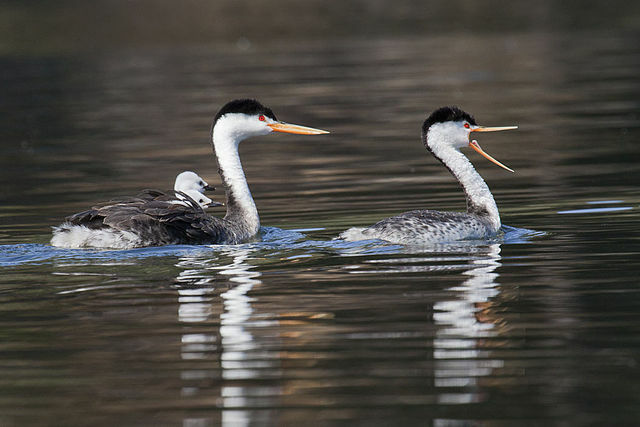 “The Latin genus name for “grebe” means “feet at the buttocks”—an apt descriptor for these birds, whose feet are indeed located near their rear ends. 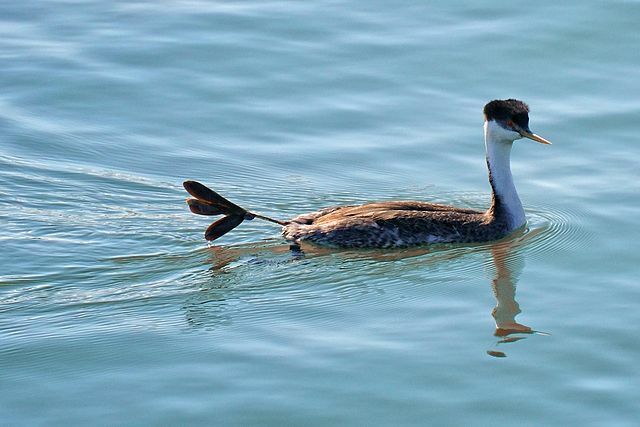 This body plan, a common feature of many diving birds, helps grebes propel themselves through water. Lobed (not webbed) toes further assist with swimming. 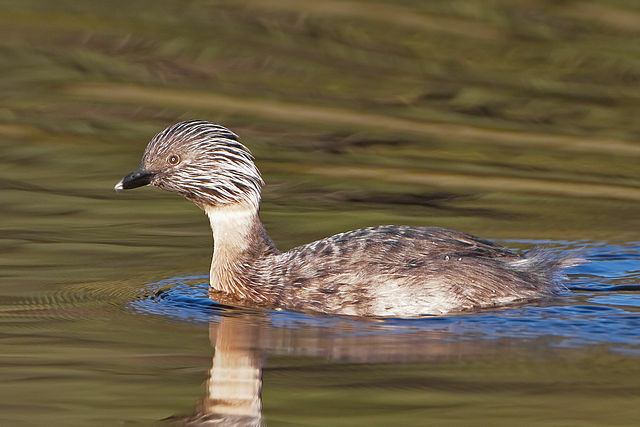 Pied-billed Grebes pay for their aquatic prowess on land, where they walk awkwardly. 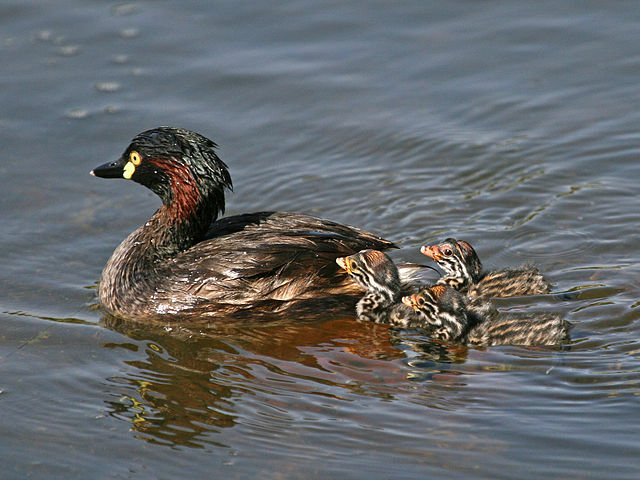 Grebes are small to medium-large in size, have lobed toes, and are excellent swimmers and divers. Although they can run for a short distance, they are prone to falling over, since they have their feet placed far back on the body. Bills vary from short and thick to long and pointed, depending on the diet, which ranges from fish to freshwater insects and crustaceans. 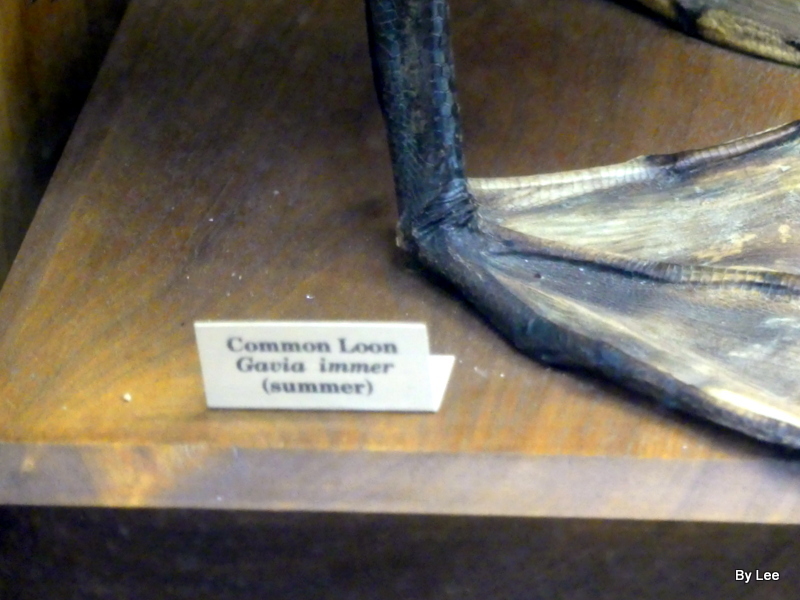 The feet are always large, with broad lobes on the toes and small webs connecting the front three toes. The hind toe also has a small lobe. Recent experimental work has shown that these lobes work like the hydrofoil blades of a propeller. Tachybaptus is a genus of small members of the grebe family birds. The genus name is from Ancient Greek takhus “fast” and bapto “to sink under”. It has representatives over much of the world, including the tropics. 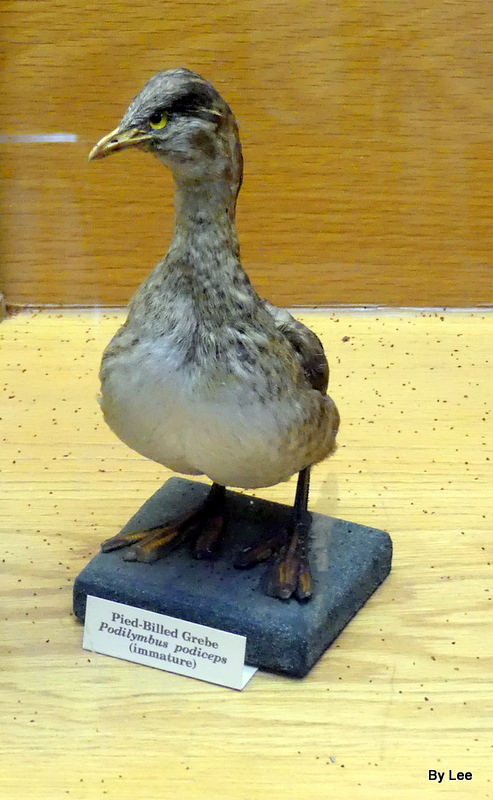 is a genus of birds in the Podicipedidae family, containing the extinct Atitlán grebe (Podilymbus gigas) and the pied-billed grebe (Podilymbus podiceps).The genus name is derived from Latin Podilymbus, a contraction of podicipes (“feet at the buttocks”, from podici-, “rump-” + pes, “foot”)—the origin of the name of the grebe order—and Ancient Greek kolymbos, “diver”. 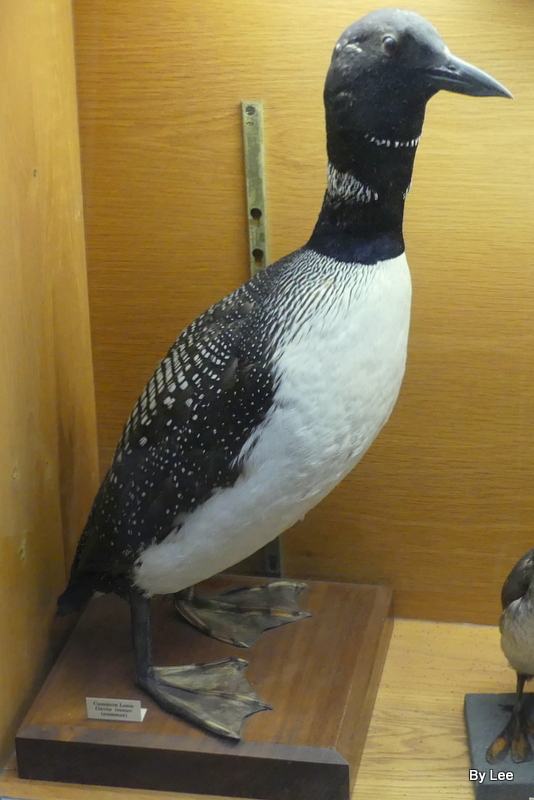 Rollandia is a small genus of birds in the grebe family. Its two members are found in South America. 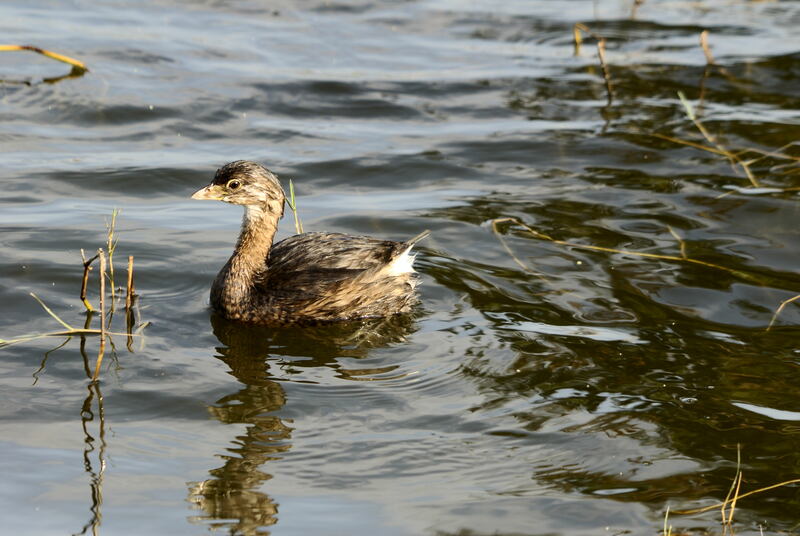 They are: White-tufted Grebe (Rollandia rolland) and Titicaca Grebe (Rollandia microptera). Poliocephalus is a small genus of birds in the grebe family. Its two members are found in Australia and New Zealand. They are: Hoary-headed Grebe (Poliocephalus poliocephalus) and New Zealand Grebe (Poliocephalus rufopectus). Podiceps is a genus of birds in the grebe family. 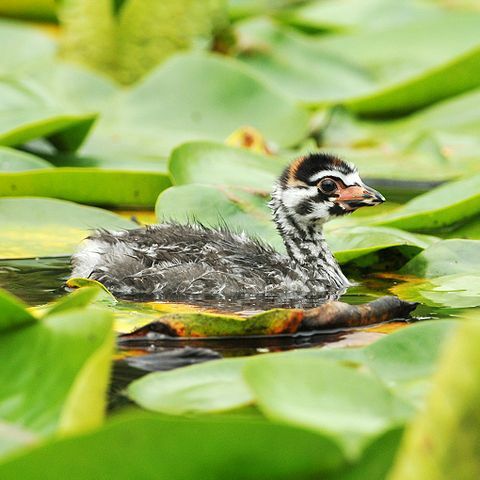 The genus name comes from Latin podicis, “vent” and pes, “foot”, and is a reference to the placement of a grebe’s legs towards the rear of its body. It has representatives breeding in Europe, Asia, North, and South America. Most northern hemisphere species migrate in winter to the coast or warmer climates. 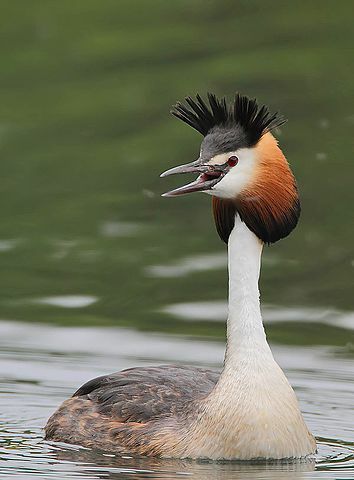 Great Grebe (Podiceps major), Red-necked Grebe (Podiceps grisegena), Great Crested Grebe (Podiceps cristatus), Horned Grebe (Podiceps auritus), Black-necked Grebe (Podiceps nigricollis), Colombian Grebe (Podiceps andinus), Silvery Grebe (Podiceps occipitalis), Junin Grebe (Podiceps taczanowskii) and Hooded Grebe (Podiceps gallardoi). 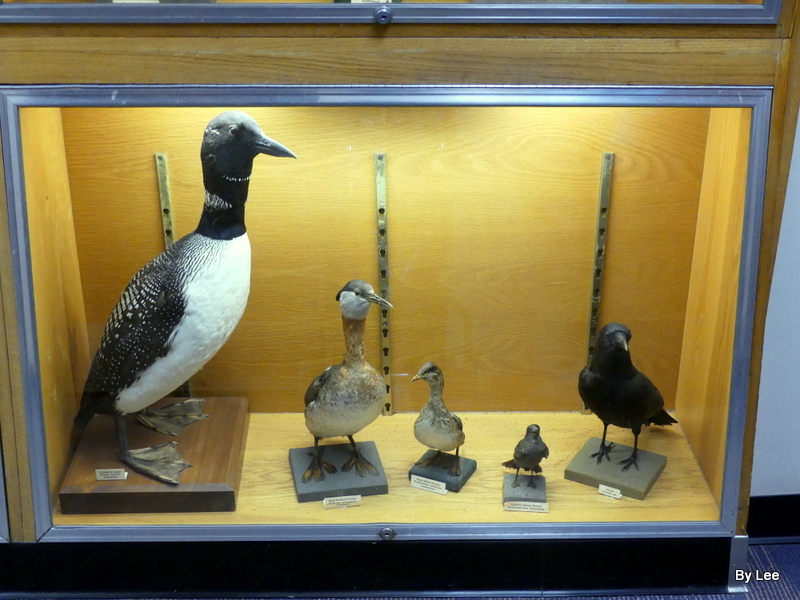 Aechmophorus is a genus of birds in the grebe family. 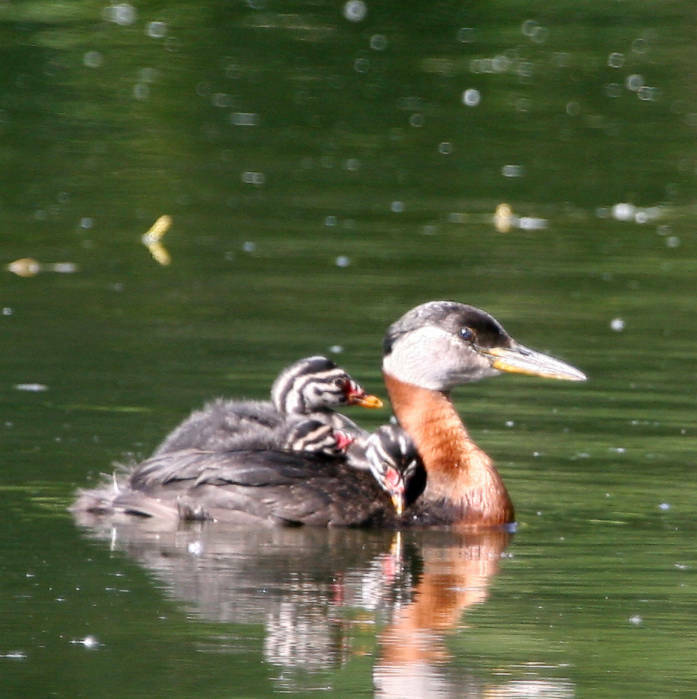 It has two living representatives breeding in western North America; the Western Grebe (Aechmophorus occidentalis) and Clark’s Grebe (Aechmophorus clarkii). 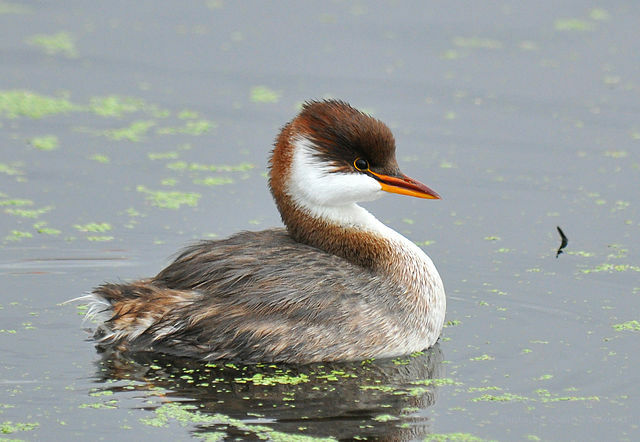 The western grebe has a straight bill with a dull green-yellow color as opposed to the Clark’s grebe, which has a slightly upturned, bright orange-yellow bill. In both species the male has a longer and deeper bill than that of the female, making it a distinguishing feature. 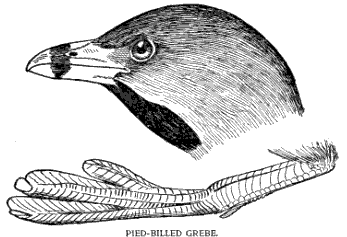 All species of grebes display the pattern of lobed feet. A tough skin surrounds each toe separately, providing more surface area for effective swimming. This form increases the power of propulsion per stroke and reduces drag when the bird is recovering. 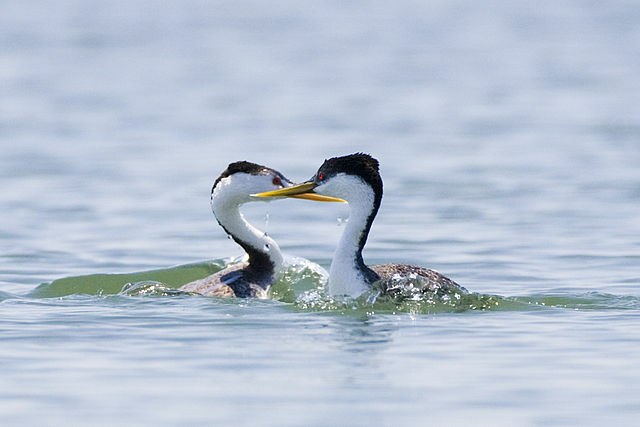 Western and Clark’s grebes take part in a courtship display known as mate feeding. This occurs regularly between a mated pair during the period prior to hatching of nestlings. In both species mate feeding appears to peak shortly before egg laying and involves the male providing large quantities of food to the begging female. Pairs will also engage in a spectacular display, by rearing up and “rushing” across the surface of the water side by side, making a loud pattering sound with their feet. When I was in Dublin – I’m now back home in North Queensland – and we were waiting for the arrival of my niece’s baby, we used to take the dogs for a walk in nearby Bushy Park along the River Dodder. 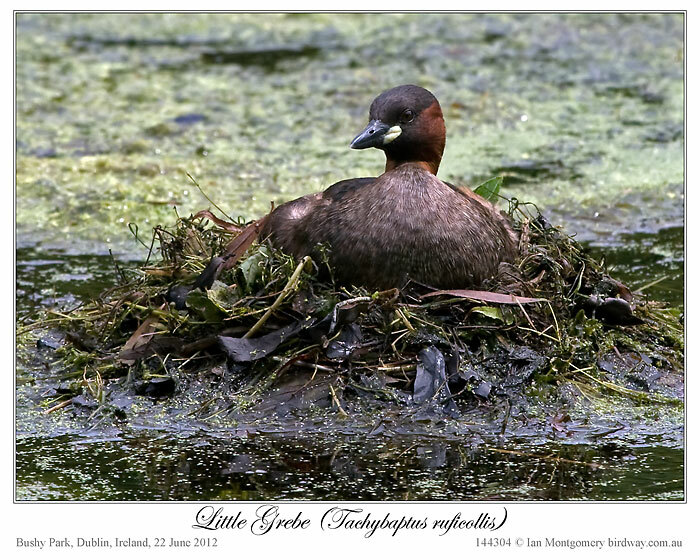 In the park, there is a large artificial pond with an island and I soon found this Little Grebe or ‘Dabchick’ patiently incubating eggs on her nest. Grebes are usually fairly shy, so a nesting one is a good photo opportunity as they build their floating nests in the open in shallow water. The nest is anchored to submerged vegetation and branches and the fact that it is floating gives it some protection from changing water levels after rain, for example. The second photo was taken on the 26 June, the day when my niece’s daughter finally arrived. 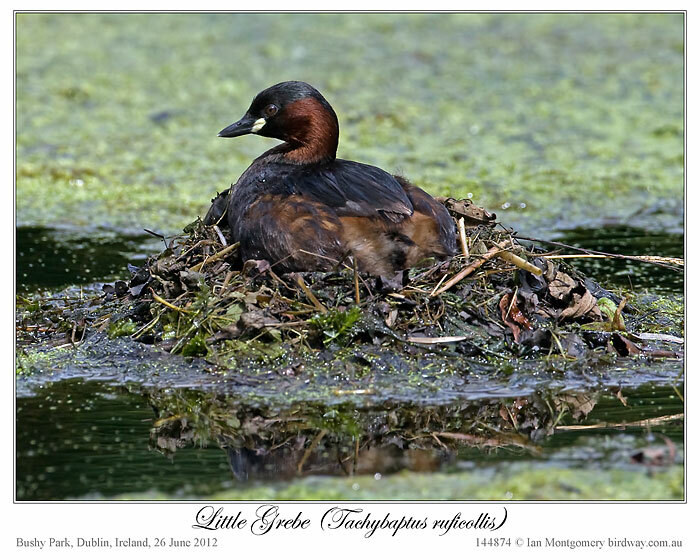 It was a while before I could check the progress of the Little Grebe again and when we returned on the 9th June, third photo, the nest had vanished and, as there had been some bad weather in the meantime, I feared the worst. 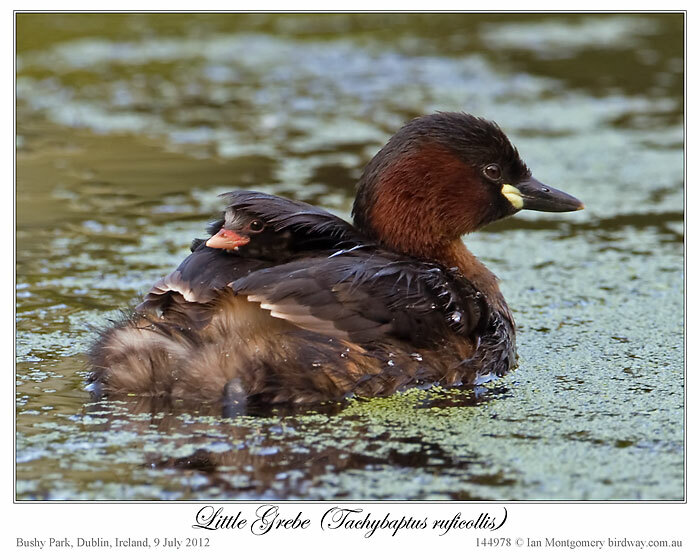 Both adults were still present but there was no obvious sign of any chicks. However, if you look carefully at this bird, you’ll see that the left wing is slightly raised and not folded flat. 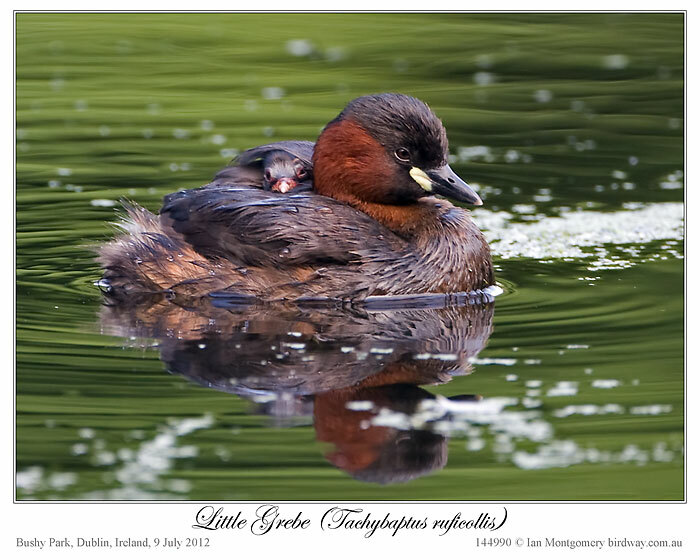 The reason for this became clear when the bird turned around, revealing a chick carefully tucked away under the wing. The fourth photo was taken on the same day. We returned again 4 days later and I saw only the one adult and no chick but there is plenty of cover around the island and I may have missed it. 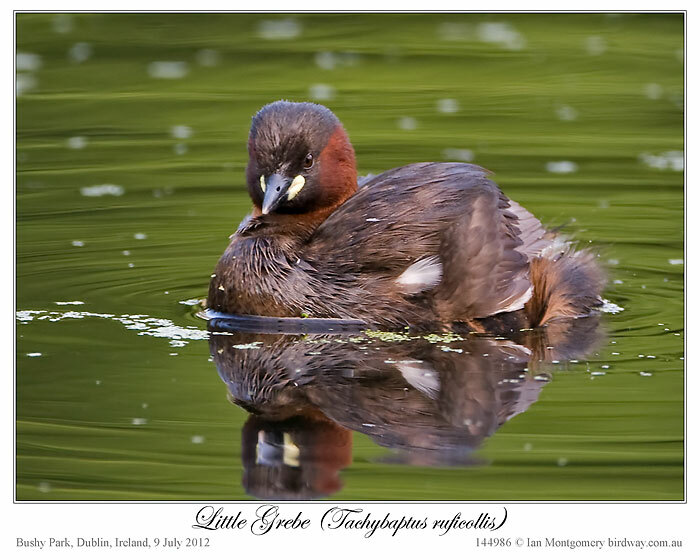 Any Australian birders would immediately notice the similarity between the Eurasian Little Grebe and the Australasian Grebe. They can be distinguished in breeding plumage by the amount of rufous on the neck, throat and breast. 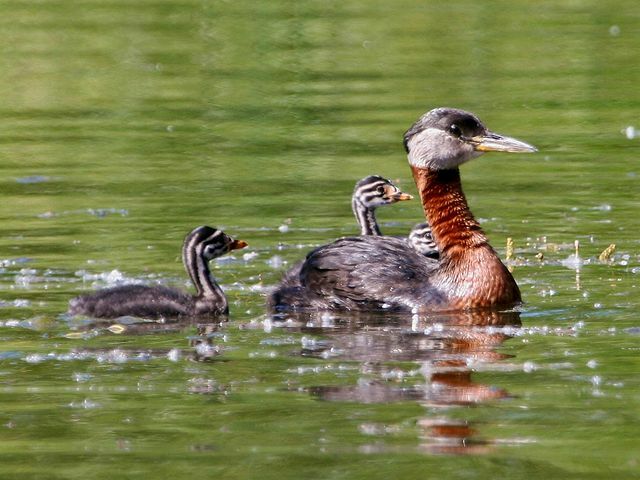 These are rufous in the Little Grebe (hence the specific name ruficollis) but the throat and breast of the Australasian Grebe are black as in the fifth photo. 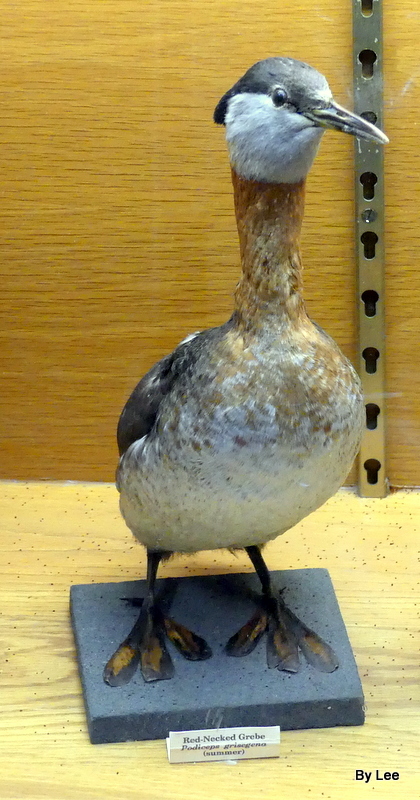 Other distinguishing field marks are the yellow, rather than reddish-brown, iris and the greater amount of white under the tail of the Australasian Grebe, though the latter is not evident in this photo. These are fairly trivial differences and for a long time the two were treated as conspecific. 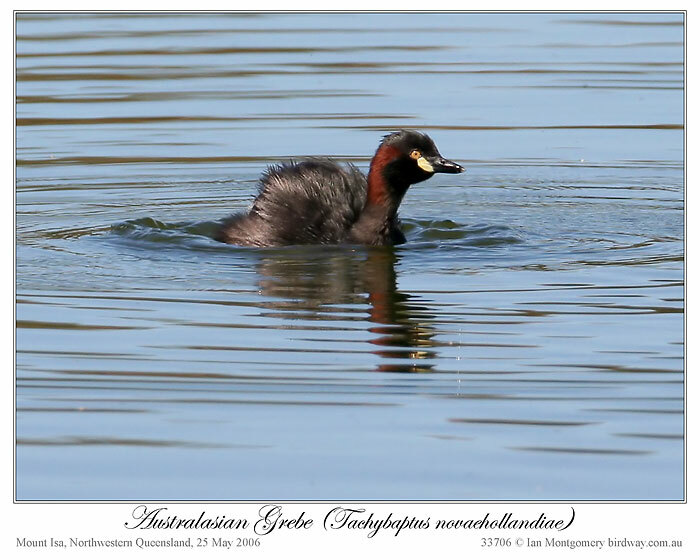 However, the ranges of the two overlap in New Guinea (are ‘sympatric’) and it is usual to treat them as separate species with the Little Grebe being widespread throughout Eurasia and Africa and the Australasian Grebe occurring in New Guinea, Australia and New Zealand. 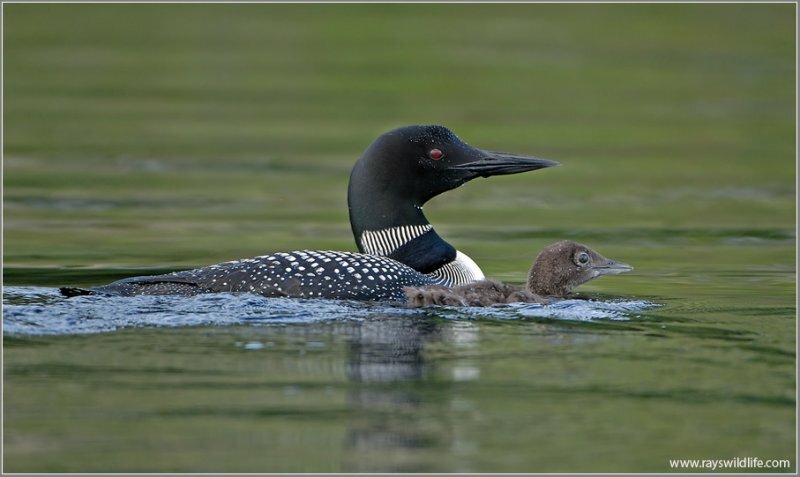 I love the photos of the little one riding under the wing of the parent. Of course that brings to mind several verses. We see the Pied-billed Grebe and the Horned Grebe here. It would be neat to see those two that Ian had the privilege of seeing. 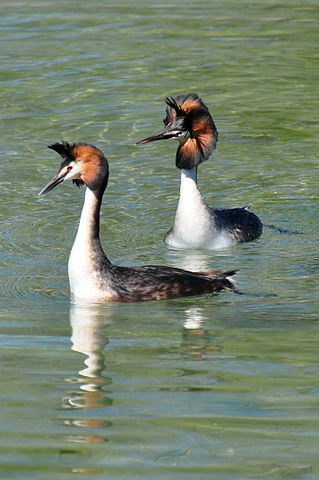 The Grebes belong to the Podicipedidae family. There are 23 Grebes worldwide. Ian’s Bird of the Week articles.